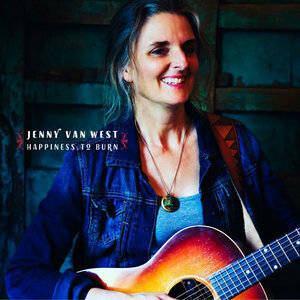 Jenny Van West's Happiness to Burn is resoundingly influenced by country music yet toys with the genre by infusing optimism, compassion, and modernity. Hailing from Portland, Maine, Jenny Van West first established herself as an accomplished songwriter. In 2015, she won Maine Songwriters Association songwriting contest with the single "Nellie". Then her song "Happiness to Burn" was a finalist in the 2017 contest. Without a doubt, her extraordinary songwriting is well represented in her second full-length album, Happiness to Burn. Funded by a Kickstarter campaign, the album is scheduled for release in April. Produced by internationally acclaimed singer-songwriter Shane Alexander, Happiness to Burn is resoundingly influenced by country music. Yet the album toys with the genre by infusing optimism, compassion, and modernity. The album starts off energetically with the title track. Van West's line "I've got my heart on my sleeve" is catchy, sweet, and establishes an optimistic tone maintained for the rest of the album. Drum brushing and jaunty rhythms render an unequivocally jazzy atmosphere and a bossa nova feel. "Happiness to Burn"'s distinctive swing creates an incredibly nuanced track that is unlike anything else on the album. But "Happiness to Burn" is more than a jazzy title track. The song's unique musicality showcases the depth of Van West's talent and creativity. To begin an album with a song that defies listeners' expectations is a bold move but will certainly widen her audience. The rest of the album returns Van West to her country roots specifically the tracks "45", "Where I Stand", and "Empty Bowl". "45" will evoke a physical response from any listener. With toe-tapping abound, Van West uses "45" to create a sense of down-home festivity. It is Van West's vocals that stand out on the album. The tracks "Where I Stand" and "Embers" are spellbinding. Van West is backed up by renowned musicians such as Jesse Siebenberg on lap steel, pedal steel, and dobro; Carl Byron on piano, organ, and accordion; and Ted Russell Kamp on bass. But their musicality is overshadowed by Van West's vocals. As a result, listeners are brought into Van West's world where we hear her personal experiences and understand the album's introspective qualities. Happiness to Burn conveys a refreshing sense of optimism. In the track "Never Alone" Van West reminds listeners to "have courage, everything is going to be alright". This message shins in its simplicity. As a whole, the album highlights Van West's poetic sensibility. She masterfully composes scenes that are at first melancholic but then rise with a buoyant energy. This is epitomized by "Never Alone". First Van West laments that "the days are dark without you" then transitions to the heartened lyric "gotta have faith, gotta have heart". This optimism attests to Van West's ability to create music that is more than just a broken-hearted lover narrative. "Live in a New Way" relies on a twangy guitar that returns listeners to country music while sounding a call for a peaceful existence. Van West found inspiration for this track from the protests decrying the murder of Freddie Gray. This is evident by the line "I saw Mama crying, Daddy didn't make it home tonight. Tired of the dying, just want everyone to be alright." "Live in a New Way" showcases Van West's ability to channel a poignant sense of compassion while challenging listeners to normalize peacefulness. In doing so, she sharpens her classic country sound with modernity and emotionalism. Arguably the standout track on her album is "Twenty Seven Dollars". The track lyrically touches on the tropes of classic country by featuring a gin guzzling character named Kitty who lives in Kansas City. But then Van West subverts expectations again by flipping the gender norms typically heard in old-time country. For example, Van West sings that she'll "go see a boy who loves me a little too much" thereby replacing the heartsick heroine and creating a vulnerable male character. As such, she undermines the musical version of the male gaze while reasserting her own subjectivity. The press release for Happiness to Burn mentions that Van West took a hiatus from music at one point. Listening to her album, you'd never believe she'd leave the art form which enabled her able to create such inspired music. Van West's music is endowed with a sense of individuality and heart that will entrance listeners. Happiness to Burn is grippingly resonant and demonstrates a visionary understanding of society and music.